As is obvious from the first line of this table, the income tax system in the UK is progressive. 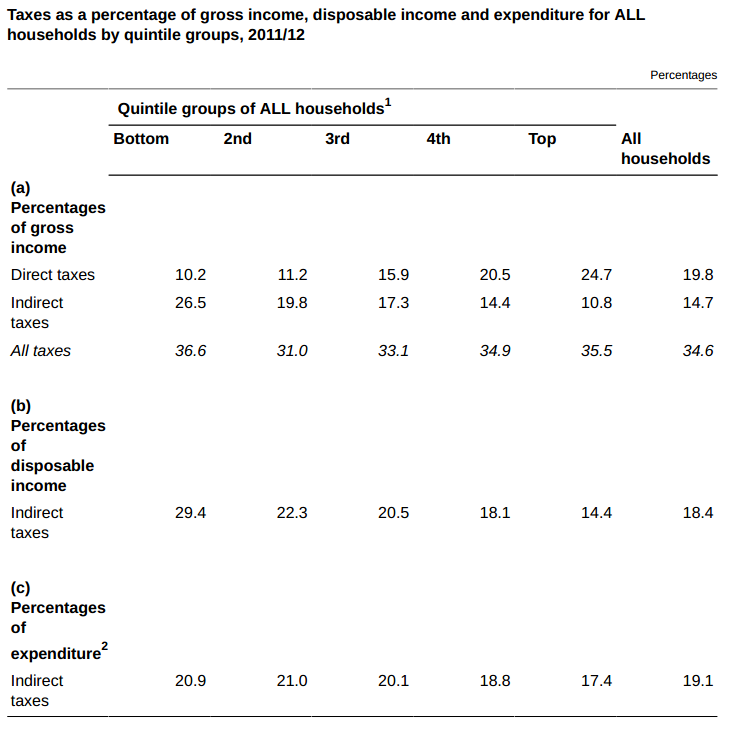 The amount of income tax and national insurance paid increases as income rises, but do note for this purpose that people are split into just five bands - and that means that the top band covers all higher rate tax payers and quite a lot of other people too - and the true tax paid by the really wealthy is not reflected in this survey. More telling is the next line. Indirect taxes - so much loved by the current government and many tax theorists at UK universities - like VAT, alcohol duty and so on impact most on the poorest. That is something I have long argued. Put these together and you see that the group with the highest tax rates in the UK are the poorest - paying more of their income overall than the most well off, quite astonishingly. The reason is clear as the last two lines show - and that is that as a part of their spending indirect taxes have a much higher impact on this group and their capacity to spend - despite the zero-rating and exemption fo so called essential items. The result is a very clear social injustice being perpetuated by the UK's tax system that the attack on social security benefits only exacerbates. Clearly the poorest are paying the most but what strikes me in this is that when taking direct and indirect tax into account, the tax system throws up a surprisingly flat tax result. So to all those who want a flat tax regime…well you’ve got one. Which of course means we need to increase taxes in the upper quintiles to restore the justice that only comes from a truly progressive regime. When you dig a little deeper you see that the bottom quintile received cash benefits of £7,419, which is more than double the amount paid on indirect taxes (£3,400), so the whole of their indirect taxes are actually paid by other tax payers. Shall we stick to facts? It isn’t absurd it is simply a statement of the net position using the facts in the report. If indirect taxes were increased, but benefits were increased to compensate for that, then your analysis would say the system was less progressive, despite the fact that end position for the individual may be exactly the same. If indirect taxes were decreased and benefits cut at the same time, then your analysis would say that the system was now more progressive, again in spite of the fact that the end position for the individual may be exactly the same. It is only the net position after tax and benefits that actually means anything. Is there an adjusted % which includes subsidies, benefits, etc paid out to the various quintiles? That would provide a more full picture. It looks as though, taking into account gross income – taxation + benefits, the gulf/gap is not as being made out on these pages. There’s an interesting bar chart that shows on average what each qunitile pays and receives in taxes and benefits, and I guess it shows the transfers between quintiles. On average, the top quintile households make a net contribution of about £20k p.a. each and the bottom and 2nd qunitile house both receive about £10k p.a. each net. The 4th quintile’s net contribution is about £5k and the 3rd qunitiles net receipt is about £5k. I’m not saying that these are too much or too little, but it is probably also worth pointing out that there are transfers between age groups and those with more or less children i.e. households make more or less net contributions as they change over time. It wouldn’t be hard to imagine younger lower income households with no children with a single earner, to slightly higher income/older with two incomes and no children, to couples with children and one parent full-time and one part-time, to middle aged and beyond couples with 2 full time incomes and children have left home, to retired couple, to a single retired widow/widower. I find that indirect tax figure for the lowest quitile hard to believe, it would be interesting to see it split out into type of tax given there is no VAT on rent, transport and basic foods (probably 70-80% of expenditure at low inceom levels . So how it ends up that lowest quintile is paying a higher proportion of indirect axes on expenditure certainly seems strange. The problem is that in the bottom quintile you will have a whole range of people that spend more than they receive in income, students being the classic example. The percentage of income spent on indirect taxes can be very high because the student loan isn’t income. Another example might be a pensioner living on a combination of pension income and capital. The table covering indirect taxes as a percentage of expenditure instead of disposable income shows that indirect taxes are not regressive. The rise in VAT seems to have hit the wealthiest more than the poorest so VAT might be progressive? It looks like the high percentage for indirect taxes to disposable income for the poorest households is mainly due to them spending more than they earn (and wealthier households spend less than they earn). Most of the poorest households are going to be pensioners, students and the temporary/recent unemployed. They will be spending money they have accumulated when they were wealthier or will be building up debt that they hope to pay off when they are wealthier. The wealthier households will be spending less because they are paying off debts (e.g. student loans) or saving for retirement. This report doesn’t really show that the tax system is that bad for reducing inequality. Or shall we say, just wrong? You also think most poor households have wealth? Do you really think that’s why students borrow? And why loans sharks thrive? I’m trying to understand what the numbers actually mean, and I think things are a bit more complicated than the UK tax system and all indirect taxation is unfair based on this report. I am definitely not saying that there isn’t unfairness or that the very wealthiest shouldn’t pay more tax or that there are not some very low income people struggling under the current system. It looks like the TV licence fee is a good example of a regressive tax and could be more than 1% of the disposable income of the lowest quintile, but less than 0.25% of the disposable income the top quintile. I’m less certain that VAT is regressive and the report seems to say that the VAT increase did not increase the indirect taxation of the lowest quintile but did increase the indirect taxation of the top quintile. Yes, but some of the income that is not spent is being used to pay off debts they accummulated when they were earning less (e.g. student loans) or to save for times when they have less income (e.g. when they retire or are temporarily unemployed). Households move between the quintiles, and that is as much an argument for more redistribution as for less. The numbers seem to be saying that the lowest quintile households spend more than their income, which explains almost all of the deceptively high indirect tax to disposable income. There could be a lot of reasons for that e.g. they have other sources of income that are not included, they have savings that they are spending, or they are borrowing the money. I don’t think loan sharks play a big role in this because they would quickly go out of business lending to people who always spend more than their income, and can’t pay the money back plus a lot of interest. That isn’t to say that loan sharks aren’t a plague on desperate low income households. Overall households that use loan sharks are going to end up spending a lot less and paying a lot less indirect taxes. I do think that some low income households have “wealth” that they are using to cover the gap between their income and expenditure. A large percentage of the low income households are pensioners. Some will have savings or other assets (e.g. houses) that they will use to cover the gap between their disposable income and their spending. Couples with new families face a drop in income as one parent works less and expenditure rises, and spend savings to cover the shortfall. The recently unemployed will spend their savings to maintain their lifestyle in the hope that new work will come along soon. Other households may be in a position to borrow more and can convince lenders that they will pay it back when their incomes are higher. Students borrow when they are studying, but will pay it back when they are wealthier and can afford to. I wonder how much exposure you have to those outside the top quintile? Your comments would suggest the answer would be little. While I agree with you on many things, the title and text don’t particularly match the ONS report, and your conclusions may be a bit perverse. It is a bit shocking that the percentage of disposable income going on indirect taxes for the bottom qunitile is 29.4%, especially as VAT is 20%. I presume this is because lower income households spend more of their disposable income on very highly taxed “sin” items like alcohol, cigarettes and petrol. Therefore the best way to reduce the indirect tax burden on the bottom quintile is to cut taxes on these items? Household income is also probably a poor way to look at things and draw any conclusions e.g. a single unemployed person versus a family of 4 with 2 working parents versus a retired couple on a state pension. That’s stretching things and depends on what you mean by “the most well off”. Someone earning £150k (well off but surely not “the most well off”) pays around £60k in tax and NI which is 40% of income before a single penny is spent on VATable goods or anything else that attracts tax. I’d be surprised in such a person wasn’t paying 50%+ of income in direct and indirect taxes. Even someone on £78,300 which is given as the ‘average income’ of the fifth richest households ought to be paying around 33% in tax/NI so I can only guess they mean two income families. Certainly someone on £39,150 will be paying around 25% in tax/NI which is closer to the 24.7% in the table. Gary (above) raises the point of spending on indirect taxes exceeding the rate of inflation. Looking at the ‘further analysis’ shows that this is because of expenditure on alcohol, tobacco, the TV licence, and (bizarrely) the National Lottery Fund. The ‘further analysis’ also reveals that in some cases annual expenditure by the lowest quintile income households can exceed their income because it includes retired people and people temporarily out of work and students which they admit can distort the picture as such households are spending from savings and loans not income. I think it’s going a bit far to say that the report shows that the lowest income households pay more in tax than “the most well off” but it does show that the lowest income households are payig more in tax than might be thought. Why? Why not the top? Like I say, it depends on how you define “the most well off”. I doubt those at the lower end of the top quintile would consider themselves “the most well off” in society. As I demonstrated, someone on £150k a year pays a lot more than 24.7% of income in direct taxes. Someone on that high an income will be paying a higher percentage of their income in direct and indirect taxes than someone on, say, £15k. That’s as it should be but it’s a distortion to suggest or imply that this isn’t the case. It would be closer to the truth to suggest that most households pay proportionately about the same in direct and indirect taxes, roughly a third. Those lucky enough to be at the very top end of the income spectrum pay more. I didn’t ‘concentrate on the lowest quintile”. The first part of my post was about the upper quintile. Then I cleared up a query from Gary that impacts on all the quintiles. Then I pointed out a comment from the ONS themselves on the lowest quintile regarding how the data should be fairly reviewed. I fully accept that indirect taxes are regressive. If you want to argue that indirect taxes are regressive and should be lowered and replaced by direct taxes on the wealthy, that’s an argument to make. But you can’t say that the less well off pay a higher proportion of their income in total taxes than “the most well off” because they don’t as I’ve clearly demonstrated. Unless you catagorise “the most well off” to include people who aren’t even paying tax at a 40% marginal rate. What is the effective rate for the bottom once benefits are included in the calculation? That one is easy. The effective tax rate for the bottom, once benefits are included, is zero! The ONS report includes employee’s NIC as a direct tax. You’ll note I referred to direct tax not income tax. Someone on £150,000 p.a. will pay £53,598 in income tax and £6,214.40 NIC. That’s £59,812.40, which is 39.875% of their income. So my statement is pretty much correct. It is quite simply not true to say that those in the bottom quintile are paying more tax than the most highly paid in society. Richard, I’d be interested to know your thoughts as to how you think the issue of regressive indirect tax should be dealt with. I fully agree that indirect taxes are regressive (in relation to income), but as long as there are decent exemptions/zero rating for VAT on essentials (which I would take to mean food and children’s clothing) I don’t have an issue with having high taxes on goods like alcohol, cigarettes and petrol – in fact I think high rates on those products are a very good idea indeed in order to discourage consumption. But high rates on those products are (as we see through the statistics here) likely to make indirect taxation more regressive. Would you like to see a cut in fuel, alcohol and tobacco duty? OK, but without that sort of total system reform what would your response be? My question is would you choose to cut alcohol, fuel and tobacco duty? I can’t see a discussion in that paper about cutting alcohol, tobacco and fuel duty as it stands in our current system – forgive me if I am missing it – but I am interested to know your opinion…?